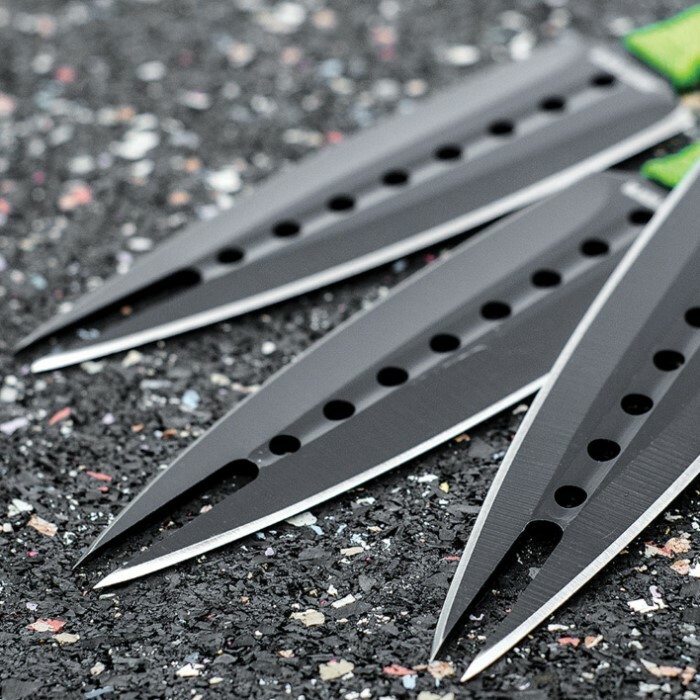 A new twist on the kunai knife, these modern throwers are packing twice the points! Features include one piece construction, double edged blades, kunai style ring, and bright "Zombie apocalypse" green handle wrapping. Each knife measures 7 1/2 in. A black nylon sheath with belt loop is included. First three throws i did with these and the very small light string broke on all three knives due to the sharp edges from the other knives. Once I replaced the green with thicker black rope, they are more handle heavy and doesn't cut as easily. The knives are good.But...they demand a consistent throwing style. take a step back or froward to find the sweet spot. Count on grinding off bent tips. These are sharp out the box. Buy 2 one to destroy " you will destroy them" one to keep. They feel kind of cheap and dinky in your hand but they actually throw well and stick well. I'm surprised, but I haven't had trouble with the points bending either. These were a great buy on sale at $7, but I think they'd be a good buy at $12, too. 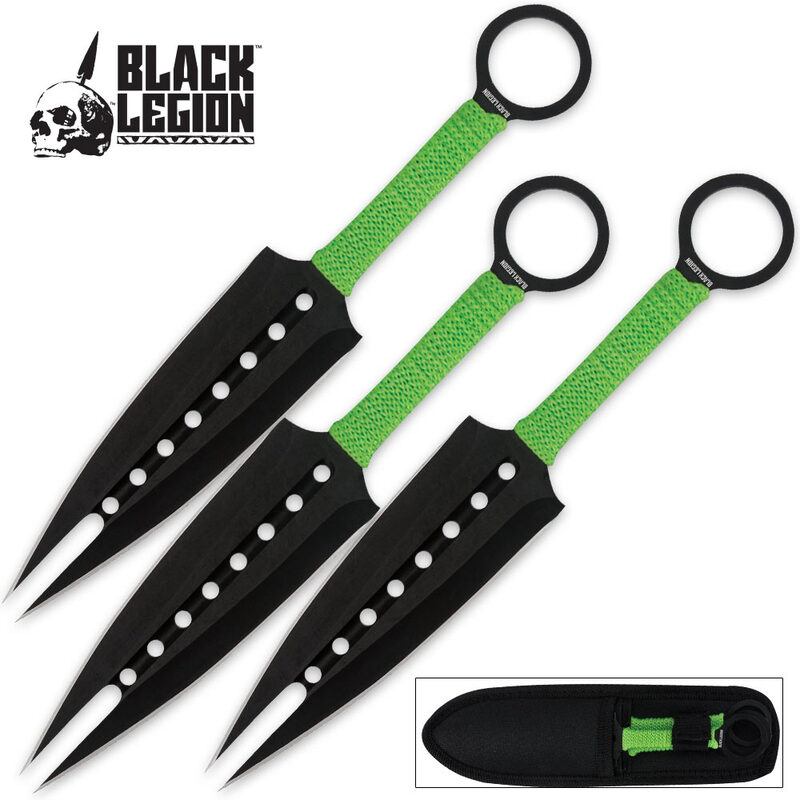 i just got these throwing knives and the black legion undead survival jungle knife like at 1:54 p.m. and im loving them already the throwing knives stick through cardboard really well and they just stick perfectly threw wood. I would recommend getting both the throwing knives and the survival knife. Thank you BUDK you guys always impress me. This 3 piece throwing knife set is a nice little set. They came in great condition, no scratches or anything of the sort. If they were a little longer and balanced, they would be purely amazing and worth more! For $4.95 you cannot go wrong with these, you spend that much on one use things or even things that break trying to use. 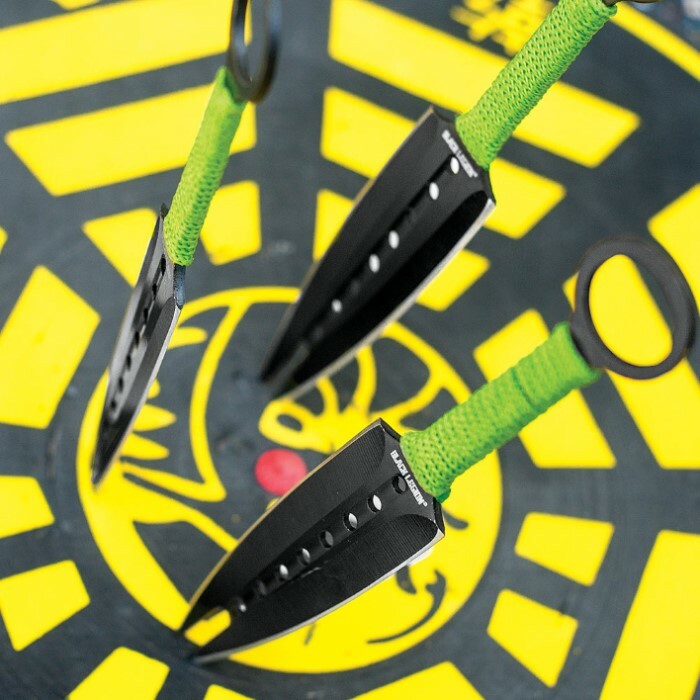 So for the price, you cannot go wrong with these throwing knives. I have not tested them out yet but they are for display in my case. I am a collector and enjoy adding these to my collection! They bring a nice look to the table so to say. I'd suggest purchase during free shipping, that way you can either get two sets (one for use and one for display) or enjoy them for their price of $4.95. Like I said, you can't go wrong with the price and quality of these throwing knives. Looks great, but that's about it. I would buy a different one if you wanted one that actually could be thrown well. Bought these as a Christmas present and decided to take one out and try it before giving them to my friend. I bought them on a free shipping day, so they were a true cost of $4.98 and I can't say I am disappointed. They come with a decent edge (especially for throwing) and look very cool and sleek. After throwing the one a few times, I could tell that they wouldn't hold up to constant hard use, but I didn't pay $4.98 to gift hard-use throwers. These things are worth every penny and for their pricing/class they get a full 5 stars. Side note: The green handle helps when trying to find them after you've thrown them.